Notice what scholars call the UBS text (the formal name for United Bible Society, the copyright owner) they call 'GNT', which is the Bibleworks name and also used by scholars as the name. 'NA' stands for Nestle-Aland, a German couple who periodically update the text. In any name, this is the standardized 'critical edition', meaning a [i]compilation of all extant mss[/i] leaving in only the text they think is closest to the original. That's what 'Textus Receptus' (which Erasmus did, and the KJV translators initially used) and 'Majority Text' are as well. So there are three major critical editions, but the most prized thus far, is the UBS/GNT/NA. So you're counting four I'm not counting, and not counting 6 I am counting. So you get 56 versus my 67. I'm also counting the [i]apokriteis[/i], because they seven and are pregnant judgment preambles. So that's the diff: 9 apok + 6 amen. You need both verbs and nouns. [highlight=yellow][b]In verse order, the keywords alternate into precis sentences, effectively saying 'Answering (with juridical rule), Christ Believe See Sign (of His) Coming Answering See Jesus Christ See Christ the Sign'[/b][/highlight] etc. I put the keywords in verse order in the Notes section of the Matt24-25 pdf (link below). Pretty amazing. I don't count [i]idou[/i] cuz it's an adverb. Only verbs and nouns. Not counting [i]semeion[/i] but maybe should. If I do, all three occurrences are before v.47, and the result is still Matt25:11ab as center (total 70 is meaningful, so the 35-36th would be center). So maybe should count it, but the center result doesn't much change, drat! Paired center now starts with the prolife movement, Matt25:10, ends at Matt25:11a. I updated http://www.brainout.net/Matt24-25ParsedR6.pdf accordingly, adding [i]semeion[/i]. Do the 42 you counted, all seven to each other? Example, does 2nd Iesous seven to the first? Then seven to [i]parousias[/i]? If they don't, then either the count is wrong or it's not intended as an anaphora, and there MUST be at least a pair of them. Do the [i]Basileus[/i] refs seven to each other (I get the distance at 210, so yes)? Adding these makes the [i]kurios[/i] center later and later. Adding these 4 to the 23 I have (including numphios, in verse order, count every occurrence even if repeated in the verse), makes the center Matt25:20. Adding [i]ho Iesous[/i], seven to each other at 154-7. Including [i]parousia[/i] as a synonym, then 10 more means 39. In verse order, then the 20th occurrence puts us back at the second of the pair in Matt25:11, which is our own 2017 (yikes). Not sure [i]to onomati mou[/i] is meant to be an anaphora either, since it's a fake claim in His name, but not Him, tho the [i]ho christos[/i] refs might seven. It does in Mark. I don't know yet, but the 1050 starts with [b]"and they will see the SON OF MAN COMING ON THE CLOUDS OF THE SKY with power and great glory"[/b]. That is a bold way to start a new 1050. Then it ends with our Lord's reply to the foolish: [b]ὁ δὲ ἀποκριθεὶς εἶπεν[/b]. That is dramatic. Then after the Lord finishes the discipline, its like a [b]type of Millennium[/b] with thirds spiritual. Now, [b]950 is just after κόψονται πᾶσαι αἱ φυλαὶ τῆς γῆς καὶ[/b]. If you add 950+560=[b]1510 which is just after μακάριος. .....and, 1510+490=2000, [b]terminating with ὁ δὲ ἀποκριθεὶς εἶπεν which ends the year 2030 AD. Update on the meter. [b]I'm trying to find the prophetic historical-trend 'center'[/b], and thought it was simply the English Reformation, since that was the third amen legw humin. But I miscalculated it. There are six occurrences, so the 'middle' is not 3, but 3-4, so there are two on either side. [quote]A. Accounting, no 'theme' in the meter, except its totals based on 490, 1050, etc. Examples are Gen1, Daniel 9, Magnificat, Matt24-25, Luke 21. A. [b]Accounting[/b], no 'theme' in the meter, except its totals based on 490, 1050, etc. Examples are Gen1, Daniel 9, Magnificat, Matt24-25, Luke 21. B. [b]Balancing the accounting to the Plan of God[/b]. These have themes and are symmetrical around them: Psalm 90, Isaiah 53, Eph1. Still working on the 91, and will now hypothesize that Paul's getting it from Luke (thread [url=http://brainout.net/frankforum/viewtopic.php?f=36&t=521]here[/url] ), not Matt24. Why? Clever addition of 28+63 in Luke's two datelines equals 91, which is a play on the content of the chapter, the upcoming Tribulation. [i]Season of Church[/i] due to [i]Trib not yet[/i]. Christ was supposed to be 91 when Trib began, had there been no Church. So it's the [i]season of Church[/i], not the Season of the [i]Last Seven Daniel 9:27 years[/i]. 199 AD: Septimus Severus is in power, and the chiliasts were expecting the Millennium to begin, falsely counting from [i]ab urbe condita[/i] (753+199), which caused problems in Rome and fostered a bit of backlash against Christians. Also then was the rise of the claim that 'bishops' were vicars of Christ, and by 217 Demetrius of Alexandria for the first time 'helps' Julius Africanus claim Peter is on a bishop's list for Rome, in part to make Origen look less important (who will then (217) be courting the Severan mothers to get them to convert to Christianity). At 112, the focus is Bar Kochba aftermath. Depending on who you read, the rebellion was quelled in 135 AD, 7 years prior; with Jews thereafter being forbidden to enter the city; it's renamed [i]Aeolia Capitolina[/i], but it's not then finished in reconstruction. Judaea becomes [i]Syria Palestina[/i] the following year, first time the name is used. [quote]Matt24:32, Ἀπὸ δὲ τῆς συκῆς, sylls 1037-42. Import? Well, the Matt use of [i]fig tree[/i] exactly coincides with the takeover of Jerusalem in 1071-73 as part of the Arabs warring with Byzantium. But 210 years prior, 863, when Luke's [i]in the middle[/i] of his use of [i]fig tree[/i], thus corresponding to Matt 24:27's 833: three years [i]after[/i] Russia raided Byzantium (860), she converts; in the very year the Moravian alphabet was invented to evangelize the Moravians, as ordered by Louis the German. Bulgaria converts, the next year. Paul's endpoint is 434 AD when a sacked Roman general extracts sack money from BOTH Western and Eastern Rome as ransom for not sacking them (Aetius, see [url=https://en.wikipedia.org/wiki/434]here[/url], [url=https://en.wikipedia.org/wiki/Valentinian_III]here[/url], and [url=https://en.wikipedia.org/wiki/Theodosius_II]here[/url]). You did it again, Anonynomenon: yep, I see the Eph1:1-2 meter now. Verse 1, 33, same as Christ's age at death; verse 2 (standard formula which Peter and Jude use, lyrical), 23 syllables, the number of years' elapse after Christ died. So maybe this is the [i]earliest[/i] use of non-sevening for dateline meter, rather than how John (who also uses it that way). So Paul's writing in 59 AD by our timing, since we use Varro's [i]ab urbe condita[/i] which has net 3 too many years in it (really four, but Christ is born at the end of one of them, hence we are all stuck with saying end 4 BC). My hangup was the insertion of the [i]en+Place[/i], but grammatically it's not needed. Isaiah 57:19 LXX uses the same [i][b]ousin kai[/b][/i] structure, somewhat poetic. The mss leave [i]en Ephesw[/i] out or include it IN THE MARGIN (i.e., Vaticanus and Sinaiticus, Bibleworks has indexed those mss).. which wrecks the meter if you include it in the text. But the mss don't include it in the text. AHA. Kill me now. [b]Lemme know what syllable count you get in 2Sam23:1-3[/b], cuz it's our smoking gun, been looking for this kind of thing since 2004-2005 when I learned David died at age 77 from 1Kings 6:1. [b]Okay, now I'm officially creeped out. The DISTANCE from one [i]kurios[/i] to the next, is divisible by seven. [/b] Sometimes you start the count at the beginning (including the article) and sometimes at the end, through the NEXT full occurrence, and sometimes between them. ALSO, the count from the last [i]kurios[/i] to the next [i]numphios[/i] (exclusive to Matt25) is also divisible by seven, viz the last ὁ κύριος in Matt24 is at verse 50, and it runs from syll 1610-1612. Add 30 to get AD, and it's 1640 (end of the historical voting period after Christ's death 1050+490+70) and the end of the English Reformation, per historians. So then 1640-42.
:step1: ὁ κύριος in Matt24 is at verse 42, sylls 1373-1375. Stands for Wycliffe&JanHus when you add 30 to convert to our AD. :step4: Matt24:48, sylls 1581-83. Here it changes: 1583-1520 (so now includes BOTH instances), is 63. Period AD is 1611-1613. Easy to see why: 1611 was the KJV made official English translation, and it was revised each year thereafter. If you count the oddly proleptic ἐλθὼν for HIS COMING prior, then you go back to 1609 when Douhay-Rheims done (see above link). :step5: So v.50, noted above, from syll 1610-1612, stands for 1640-1642. Its distance is more sophisticated. Historically, the 1611 KJV was developed directly from Erasmus. But Erasmus, got some of his Greek text from what Zwingli had. So now notice: 1611-28=1583, which are syllable counts, not AD years. It was printed in 1615, but Knox was long dead by then, so I don't know when [i]he[/i] wrote it. By contrast, the [b]παρουσίας[/b] references, which start in [b]Matt24:3[/b], seem to talk about when folks ENCOUNTER missionaries and convert. So He 'appears' to them via the missionaries, they learn the doctrines enough to convert (even if often for secular reasons or monetary gain). [list][highlight=yellow]Really important: this accounts for why the distances between [i]parousia[/i] clauses always seven. 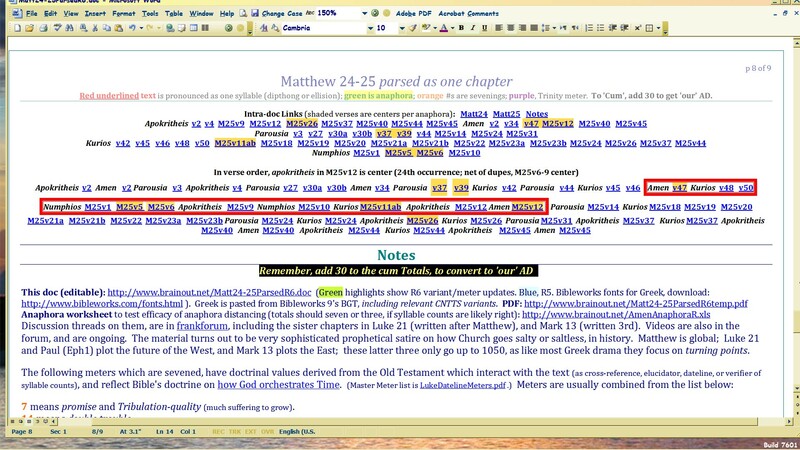 [/highlight] I didn't notice that when we parsed through revision 5, but I did notice that the sevening was [i]out of place[/i], not at the end of a paragraph as is normal in Bible meter I've found so far. So I thought I miscounted the syllables. But now that I see EVERY [i]parousia[/i] clause is a seven-factor distant from the prior and next one, it means the distances are deliberate, no matter whether they end the paragraph textually.. or not. The other implication is that I didn't think to make [i]parousia[/i] follow the YA sound, so it's always counted at four syllables. So then maybe my YA assumptions for sound on similar endings, is [i]wrong[/i]. Will have to revisit. For how else can I explain the [i]consistent sevening[/i] of [i]parousia[/i] clauses I didn't want to see sevened? That first [b]Matt24:3[/b] ref is by the apostles to Christ, so that's your big clue that [i]parousia[/i] will be analogized to Word Represented. Next time the term shows up is in [b]Matt24:27[/b], followed by [b]37, 39[/b]. Closely related and embedded, tho, is the expression [b]ὁ υἱὸς τοῦ ἀνθρώπου[/b]. which is in the above verses and [b]Matt24:30, 44[/b]. I don't know how to interpret its [i]embedding[/i]. What I do know, is that[b] Matt24:27-30[/b] are periods of intense Viking migration and conversion, including the first time (847ff) that Bible is translated into a new alphabet for Moravia. This led to the Christianisation of the Rus, who are also a Viking related people as well as the seemingly-already-established, Slavs. [b]Matt24:27[/b] covers [b]823[/b] (subtract 30 for the meter benchmark) through [b]863[/b]; with [b]847[/b], being when Louis the German conquered Moravia and then Cyril et Methodius created the alphabet for translating Vulgate into Moravian. [list]Luke 21:27 maps to Matt24:26 at 780, using [i]ho huios tou anthropou[/i] starting at Luke's syll 756 (which is divisible by 7, lol). Luke will use the phrase again in his last verse, 36, ending at 1085, which of course [i]also[/i] sevens back to the phrase [i]at both ends[/i] of his verse 27. Cute: 1085-7=1078, the syll count including ellipses, in Isaiah 53. So now I really suspect Matt24:32 should end at 1085, not 1082 unless Luke is adjusting for Varro's error. [b]καὶ σταθῆναι ἔμπροσθεν τοῦ υἱοῦ τοῦ ἀνθρώπου[/b]. [b]Matt24:30[/b] covers [b]945 to 1015[/b], when most of the stuff I've read on Viking conversions, occurs. This is the period of Erik the Red; [b]988[/b] is called '[url=https://en.wikipedia.org/wiki/Christianization_of_Kievan_Rus']the baptism of the Rus[/url]'. This is deemed start of Kievian Rus as a polity, tho its people started converting in the [b]Matt24:27[/b] period as a result of the Bible being in a language they could read. It is also a period of [url=https://en.wikipedia.org/wiki/Christianity_in_the_10th_century]extensive monastic reform[/url] that had significant teaching and economic impact wherever it expanded. What's distinctive of this period is the [i]independence from the Church[/i]. Given the new monastic separation (beholding only to the Pope, which meant autonomous), it's easy to see how that independent style would attract plunder, yet also endear the Vikings, whose political culture was much more familial so independent so federal, therefore the idea of some all-ruling pope never caught on. How ironic. But the later [b]ὁ υἱὸς τοῦ ἀνθρώπου[/b] refs don't seem to focus on them, but back to Europe? One big reason they WERE acquainted, was the [url=https://en.wikipedia.org/wiki/Constantinople]sack of Constantinople[/url] in 1204; its massive library was sacked and taken back to Rome, who with Paris had long exchanged Bible mss between their universities. So the mss the East had, came to the West, who ransacked the Greeks passim ever since the Great Schism of 1054. With the Mongol hordes still invading Russia and Eastern Europe (finally stopped at Warsaw I think, in 1294), and with the last Crusades going on (which stopped in the Middle East in 1291), it's easy to see how they would misinterpret Daniel 12. But the point is, [i]they were familiar enough with the Bible TO misread it[/i]. As DeHamel records, they lost interest in Bible when the expected 2nd coming (clever, given how 37b reads) .. didn't happen. So they didn't want Christ His Word, but a thrill. Picture Bibles were also developed during that time, to help speed comprehension, and fell out of vogue after 1260 (ibid). [b]Matt24:44[/b] could be broken up into clauses, but I didn't. [b]Spans 1463-1495[/b]. It's a closing lesson: [i]for this reason you should LEARN, make ready: as you can't calculate the hour, when the Son of Man comes[/i]. So did they? No. They turned the crusades inward from 1291 onward, picking rich pockets of Jews or others by calling them [i]heretics[/i]. The Popes offered indulgences now for [i]anyone[/i] who went after someone deemed a heretic, INSIDE one's country, or in a neighbor's. But by this time we had Gutenberg's method of printing, which rapidly became popular for all books; prior, we had the Italian Renaissance which began when Hus was just learning about Wycliffe, thus famous, his translations out and hoarded, as were Wycliffe's; there were a few other translations. The mss had come out a bit owing to the folks fleeing from the Middle East from the Crusades, especially in 1204 when the Latin Crusaders sacked Constantinople. So 'making ready' was thus done by some, and the idea of rejecting the RCC was widespread by many. But the West, was in various stages of war, both civil and international. 1469 saw the renewal of [i]who's-the-rightful-king-of-France[/i], so the Hundred Years' war which allegedly started in 1337, didn't end 100 years later. You had rival popes, which started in the West really a bit before the official 1378 'Great (or 'Western') Schism', between Avignon and Rome. You had civil wars within the countries owing to these greater competitions, with groups of people picking one side or the other. Of course, the Black Death would resurface again and again in smaller sections, notably leaving OUT, most of Poland, Milan, Pyrenees. But you also had renewed interest in the Hebrew, Greek, and translations. Lorenzo Valla of Italy, shortly before he died, compiled Greek mss he called [i]Collatio Novo Testamenti[/i], in it seems 1442, which Erasmus would later use. The Jews were expelled from England in 1290, so went to the continent where they had successive expulsions from France (of course, Henry called himself King of Normandy even then), in 1305 and following. So the Jews went to Spain and Portugal, who finally threw off the Arab yoke and shortly thereafter expelled the Jews too. But meanwhile, the Jews brought their OT in Hebrew with them, and so the West had access. After each expulsion, the area expelling plunged into internal 'crusades', civil war, and declined economically. The Jews finally found a more permanent home in Poland and Milan, just in time for the Black Death. So one could vote with his feet to find Bible. Missionary activity went seaward during this time. Gold and God, in that order. So in that sense, the prior meanings we saw for the Vikings of [b]ὁ υἱὸς τοῦ ἀνθρώπου[/b], but this time in [b]Matt24:44[/b].. now continue with the mostly Spanish and Portuguese, sailing outward. So are you surprised that v.44's ὁ υἱὸς τοῦ ἀνθρώπου ends at syll 1462 aka 1492 AD? [i]In 1492, Columbo sailed the ocean blue[/i].. maybe with a newly-minted copy of the Hebrew text, just then being published in Lisbon and Italy. Oh: and the syll distance between the NEXT syll and the syll just BEFORE the [i]ho kurios[/i] in Matt24:45 is (drum roll please).. 21! Divisible by seven! And of course THAT [i]ho kurios[/i] is.. [i]the Reformation[/i]. [b]The Son of Man[/b] title used, has often been mistaken to mean only 'prophet'. It should be translated [i]son of ADAM[/i], cuz in Dan7:13 the Hebrew is different, [i]son of man[/i] (Aramaic [i]bar enosh[/i], generic nature). [i]Son of Adam[/i] term is literal, but comes to mean 'prophet', as the prophets were all fallen like Adam was. First obvious use of it this way, is in Ezekiel 2:1, though prior uses of [i]Ben Adam[/i] are many. [i]It's the exclusive title used for Ezekiel[/i] throughout his book. Noteworthy is Eze40:4, where Christ in theophany is called ISH in the Hebrew. But not Adam. And of course, Eze40 is about the Millennial Temple, and Christ WILL BE AGAIN manifest as MAN then. So now, back to Matt24-25 and the anaphora. Notice the interplay between [i]amen legw humin, kurios, parousia, ho huios tou anthropou[/i] (which in Dan7:13 LXX [i]omits[/i] the articles, just as other LXX refs do). They are meant as anaphora in some kind of causal sequence. I don't yet know how to describe it. What I do know, is that this sequence is in [i]descending order of intensity[/i], and is thesauretical. Notice also that [i]numphios[/i] in Matt25, is used as a synonym for kurios, but obviously the relationship is restricted to BELIEVERS (parthenoi). So Christ EQUATES yet RANKS His 'appearance' or 'coming' to people with the coming of His Word in the mouths of [i]sons of men[/i] who expiate, explain, translate and transcribe it. The Matt25 kurios refs are POVs, with [i]numphios[/i] maybe replacing THE Lord in Matt24. Not sure, needs more testing. Obviously [i]can[/i] have significance of one falsely calling [i]Lord[/i] someone NOT 'the' Lord.